I’m looking forward to a series of talks and workshops in Cambodia from February 13-17 and in Vietnam from February 20-24. This series is sponsored by the English Language Programs of the U.S. Department of State. 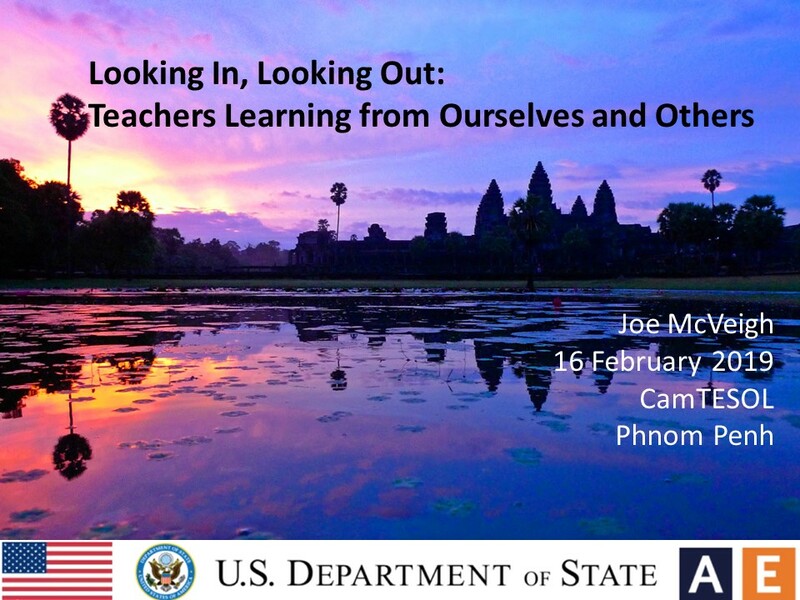 I am especially excited about delivering the opening plenary at the CamTESOL conference in Phnom Penh. If you’ll be there, I hope we’ll have a chance to meet. Here’s an overview of two talks I’ll be giving. Times and locations can be found on the Events page. 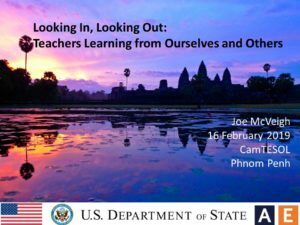 In this talk we examine ourselves and our professional learning in two ways: first we look inward, to see what we can learn from within ourselves and ourselves in relation to others; and secondly we look outward to see what we as English language teaching professionals can learn from those outside our field. As English language teachers we naturally turn to others in our profession to help us learn about new developments in the field. Today, we turn our glance first inward, to see what our own reflective practice can teach us. Then we shift our gaze to see how those who are engaged in professions that are entirely different from our own can influence our behaviors in the school and classroom. Our ultimate goal is to connect and engage with our students in such a way that their success comes from our commitment to them with our hearts, as well as our heads. In today’s world of ELT, more and more teachers are moving up in their schools and joining the ranks of managers and principals. How can aspiring teachers and managers become leaders at their institutions? In this presentation, we will explore some of the skills that teachers need to develop in order to take on leadership roles and become more effective in their work. We will begin with a broad look at qualities of effective leaders in a variety of settings. Then, we will look more closely at some key questions: Is there a difference between management and leadership? What are some of the challenges of supervising others and how can we solve them? How can we mentor, encourage, and motivate others? What are some key communication skills for managers and leaders? Finally, we will look at how leaders can encourage innovation and help guide change in their schools.